Squeeze the juice from the tamarind around 3 cups. Heat oil in a pan, add red chillies, coriander seed, dhals, fenugreek seed,curry leaves, grated coconut & fry until golden brown & grind to fine paste. Heat oil in a pan, add mustard seed, fenugreek seed,bitter gourd & saute few mins. Add ground paste ,cooked chick peas. 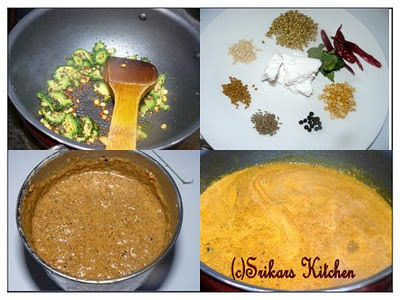 Cheeck the seasoning & add cooked thuvar dhal. Mix well & serve hot with rice. the only thing i take with bittergourd :) looks delicious! Only 1 time i have done this pitla...thanx for reminding & sharing ...looks perfect ..creamy..
Never tried this, looks yummy and tempting. 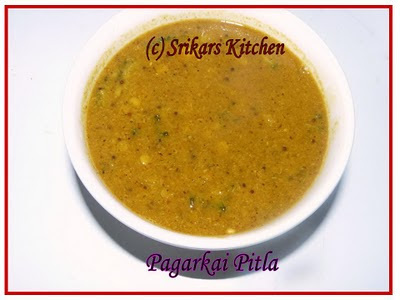 Pitla looks healthy and delicious!!!! A family favourite, urs look very nice and thick. Loved the click. Your addition of chickpeas is a nice idea. Healthy and delicious... my mom's fav. Looks very spicy, love the color!